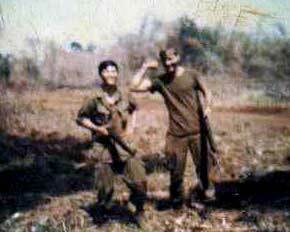 LT Rudy Cariaga and 2nd Platoon. 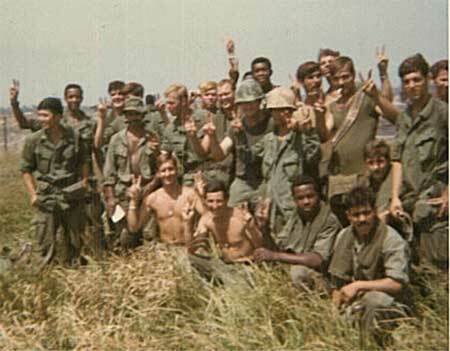 From left to right: Rudy Cariaga, Ernest Roberts, John Taylor, Danny Mora, Ralph Bauman, Tim Edwards, Jim "Chimp" Eisenring, James Cooper, Larry Brasher, Russ Griffith, David Resendez, Eddie Hancock, Mike Willis, Steve Wright, Carl Walker, Juan Calo, Jerry Sider, Steve Gerulf. 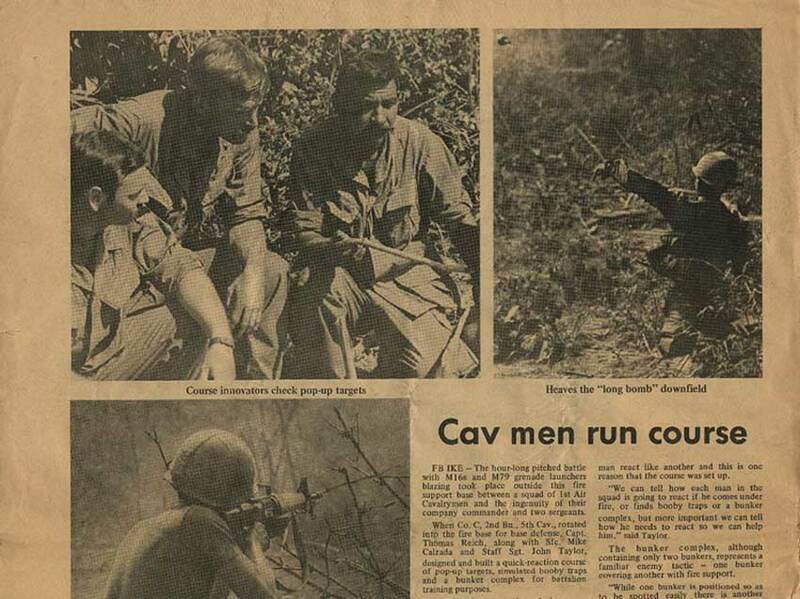 The soldier without a shirt kneeling in front on the right side of the picture is Lonny "Doc" Branch. To Doc's right, also without a shirt is Bill Wagner. 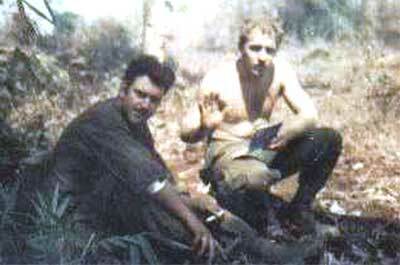 Medic Jimmy Thom and Vernon Whitehead. 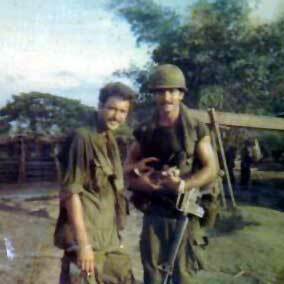 LT Rudy Cariaga and PFC Wayne "Steve" Wright. 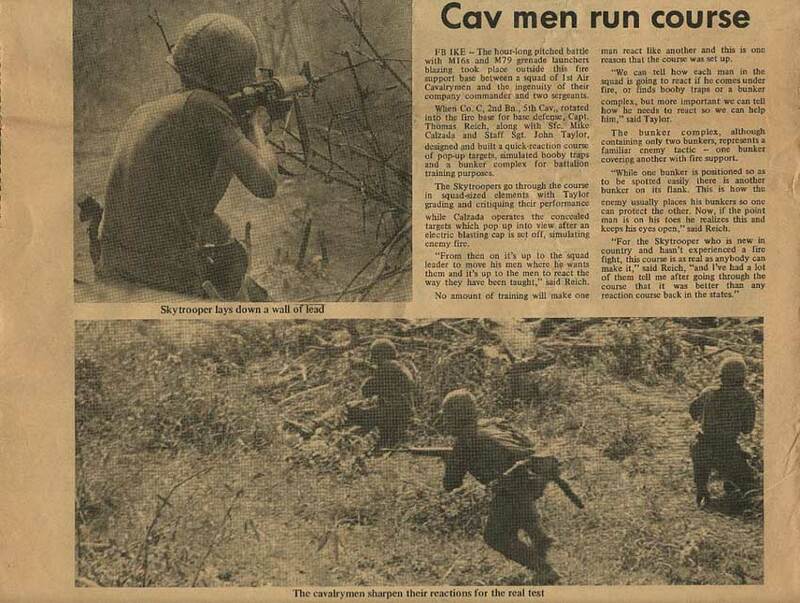 When Co. C, 2nd Bn., 5th Cav., rotated into the fire base for base defense, Capt. Thomas Reich, along with Sfc. Mike Calzada and Staff Sgt. 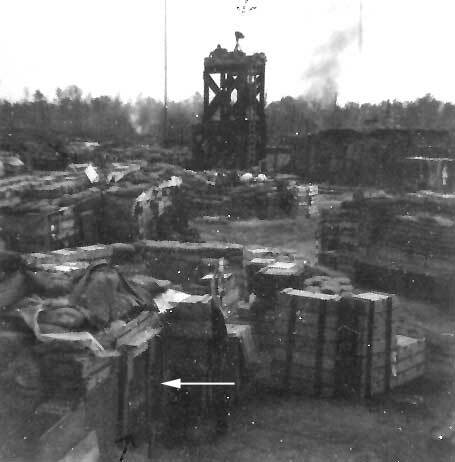 John Taylor, designed and built a quick-reaction course of pop-up targets, simulated booby traps and a bunker complex for battalion training purposes. The Skytroopers go through the course in squad-sized elements with Taylor grading the critiquing their performance, while Calzada operates the concealed targets which pop up into view after an electric blasting cap is set off, simulating enemy fire. "From then on it's up to the squad leader to move his men where he wants them, and its up to the men to react the way they have been taught," said Reich. No amount of training will make one man react like another and this is one reason that the course was set up. "We can tell how each man in the squad is going to react if he comes under fire, or finds booby traps or a bunker complex, but more important we can tell how he needs to react so we can help him," said Taylor. The bunker complex, although containing only two bunkers, represents a familiar enemy tactic - one bunker covering another with fire support. "While one bunker is positioned so as to be spotted easily there is another bunker on its flank. This is how the enemy usually places his bunkers so one can protect the other. Now, if the point man is on his toes he realizes this and keeps his eyes open," said Reich. "For the Skytrooper who is new in country and hasn't experience a fire fight, this course is as real as anybody can make it," said Reich, "and I've had a lot of them tell me after going through the course that it was better than any reaction course back in the states." Another view of FSB Ike. Looking across the 81mm mortar pits belonging to the Mortar Platoon of Echo Company, the radar tower can be seen - and the radar antenna at the top. The arrow points to the door of Ralph Spence's hootch.